The pocketbook plant is cultivated in greenhouses in northern climates and in the open in its native range. It is a somewhat demanding plant. It should never be put in too warm an environment or in a draft, for this will invite aphids. It prefers temperatures between 60 to 65°F. It requires a slightly humid atmosphere, but the soil must not be too damp and it must be kept out of the direct sun. A well-drained soil is essential. Pinch back to maintain shape and encourage blooming. If all of these demands are met the plant will give pleasure for a long time but it should be regarded as an annual. 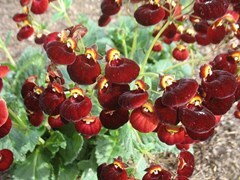 Calceolaria, commonly called pocketbook plant, is forced into bloom, sold, then discarded once the blossoms have faded. Its outstanding characteristic is the unusual flowers. They come in a range of colors: yellow, orange or red and are either solid, spotted or bicolor. They are one inch across with a swollen lower lip resembling a slipper, pocketbook or pouch and are held in dense corymbs often covering the foliage. Plants are primarily sold in late winter or early spring. The genus is native to Central and South America. Genus name comes from the Latin word calceolus meaning a slipper a reference to the appearance of the flower. Plants are susceptible to root and crown rots from the soil being too wet or fluctuations in watering. Gray mold, aphids, whiteflies, and spider mites can also be a problem. Limp leaves usually indicate the plants are too dry. Used primarily as pot plants and given as gifts in the late winter and early spring. They are a nice addition to a bright windowsill in winter and are a cheery gift with their bright colors and unusual flowers.